I have previously mentioned the System Variable dialog box [here] and I mentioned in another post that some system variables are either stored in a drawing or in the system registry [here]. But I just realized that the System Variable Dialog box shows what variables are stored where – either in the drawing or in the registry. So this makes guessing what variables are stored where very easy to find out. Why is this important? If you have ever changed a system variable while in one drawing and then moved on to another drawing and wondered why the variable didn’t carry over to the other drawing, it is because that system variable is saved per drawing. Whereas other variables are saved in the computer’s registry and will carry over to other drawings. 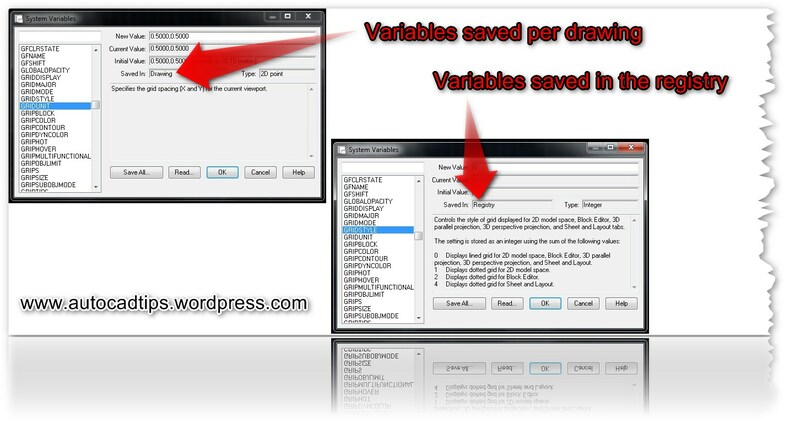 To set variables that are saved per drawing, it may be good to make a template that has the desired variables settings saved in it. Variables that are saved in the registry aren’t a problem because they transfer from one drawing to another. One problem that could interfere with variables that are saved in the registry is if you are switching profiles. Profiles depend on registry settings and depending on what the profile does, it could undo a system variable. This entry was posted in Customization, Express Tools, TIPS. Bookmark the permalink. Thanks, I was looking for this information. Help used to tell you where a system variable was saved, but no longer.